Product Name: No.18 Anti-static Turnover Box Product Information: No.18 Anti-static Turnover Box can efficiently release the electrostatic charge of the products accumulated on the surface, which will not occur the electrostatic charge accumulation and high potential difference. Product Information: Anti-static turnover box can efficiently release the electrostatic charge of the products accumulated on the surface, which will not occur the electrostatic charge accumulation and high potential difference; It is durable,moisture-proof, anti-corrosion, heat-proof,quake-proof, substantial. It can dramatically reduce the electron products spoilage during the product production, which is to reduce the cost and improve the product quality and profit. It is widely used in the turnover loading, package,storage and transportation of the electron components and products during the process of production. 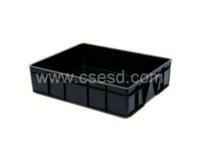 Surface Resistance: Less than 10^9Ω; Boundary Dimension: 605×430×120mm; Interior Size: 580×385×115mm.